At the arts council and among arts organizations, we are always pondering the question: what configurations of people (families, groups of friends, individuals) decide to go to an arts event, and at what point do they make that decision (three weeks before, last minute)? We have noticed a trend in the past 15 to 20 years of people not committing until the very last minute. They don’t want to pre-register unless space is limited; they want to get up that morning and only commit when their feet touch the threshold. This was strange to me; I liked a planned weekend. If I wanted to do something and it fit my calendar, I wrote it down, registered and showed up five minutes early. That was me…until I had a two-year-old. Having a two-year-old is fun, but it is messy. You want to give him or her a lot of hands-on opportunities to practice any of life’s necessities and experiences like bathing, eating and art projects. However, each requires plenty of prep time and a good amount of clean up in order to preserve your furniture and sanity. Furthermore, toddlers do not keep day planners. If they wake up in an ice cream mood; you’re going for ice cream if good behavior permits. If they wake up in a finger painting mood, then finger painting it is. My two-year-old is not a homebody either. He likes to go out, be around nature and see something new (and just about everything is new at this point). When I found out that his grandparents were coming to visit on May 25, I knew he was not going to be satisfied with being cooped up in a house with a bunch of adults or eating a nice meal at a restaurant. (He feels flatware is inefficient and overrated.) More importantly, I also knew that with his grandparents living several hours away, we should be making memories. Luckily, I “like” many of our Kentucky Arts Partners on Facebook, so I get regular updates about their activities for families. I had seen the Headley-Whitney’s announcement of a tie-dying program for at least a month. I looked at the details several times. I weighed the wills and whims of all the potential family participants. I still wasn’t sure. A week prior to their visit, my in-laws voiced an interest in eating at Wallace Station, which is right up the road from the museum. I hemmed and hawed, “Do we eat before or after? When will my son take a nap? What do we have to tie-dye? Will everyone else think this is a stupid idea? I finally decided to go the night before, and it was as though the stars had to align perfectly to make it happen. I gathered up everything white or light colored in the house (blood donor t-shirts, shoes, an apron, socks, whatever). When my in-laws arrived the next morning, I announced my plans, and they were game. They knew the baby would like it, and it was a nice day to be doing something outdoors. We arrived at the museum grounds, and all the materials were ready as advertised. The fun atmosphere was amplified by 1960s music, and staff and volunteers helped us band our shirts and such to create fun designs. The best part: we all came away with a little souvenir from a beautiful day. The second best part: when we were finished, they cleaned up the complicated mess my son made. We brought our creations home and dried them on the front porch. Since doing “Groovy Threads” I have been more deliberate about making decisions to go out and “do art” sooner and more often. I rarely ever regret the things I determine to do; if nothing else, I learn a valuable lesson. I have plenty of “would haves” and “wished I hads” about the things I opt not to do. Pay attention to those requests and posts on Facebook for the rest of the summer. 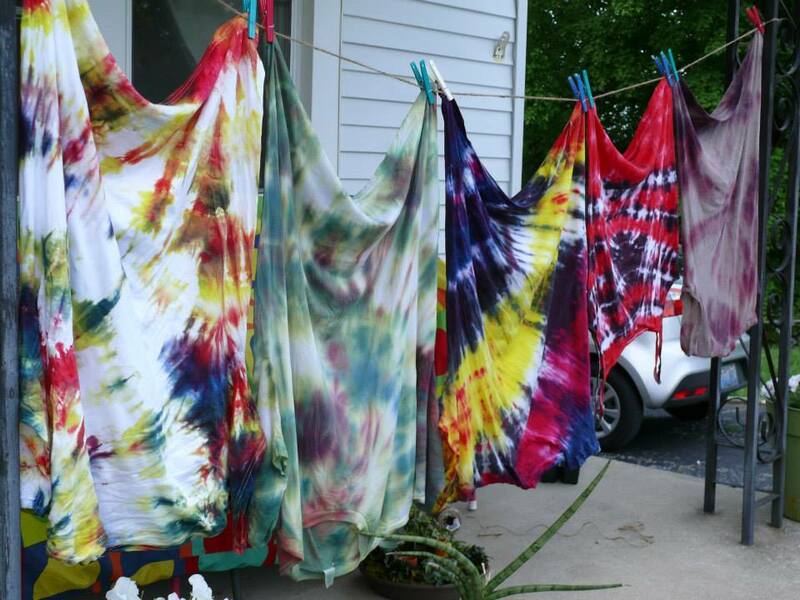 If you want to have your own tie-dye adventure, Headley-Whitney is doing “Groovy Threads Tie-Dye” again on Wednesday, July 31, 2013, at 1 p.m. If you’re looking for a way to entertain a two-year-old, they will host Mini Monet, an art class for toddlers (two to five years old) on August 3 from 1-2 p.m. And don’t forget about the Kentucky Arts Partner offering programs in your area. Create some art, and create some memories.